The Sagamore Hotel was selected by Conde Nast Traveler as *One of the Top Twenty Hottest Beach Resorts in the World*. With its prominent and unique private collection of art and photography the Sagamore is a modern interpretation of a classical European resort. The property boasts 93 striking suites including 16 two-story bungalows. All Suites have large bathrooms with whirlpool tubs and wireless internet access. 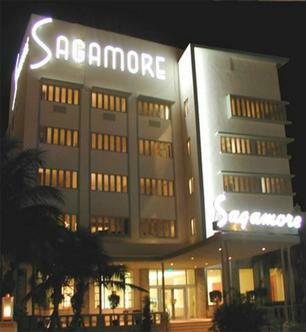 The Sagamore Hotel has direct beach access and is walking distance to all the South Beach has to offer. The Miami Beach Convention Center- Lincoln Road- Ocean Drive- shopping- galleries and exotic night life are all within walking distance so there is no need to rent a car.